The students learn about engineering practices in the U.S. and experience life as a UTSA student. (June 30, 2017) -- This summer, ten engineering students from Universidad EAN in Bogotá, Colombia, have made The University of Texas at San Antonio (UTSA) their home. As part of the 100,000 Strong in the Americas Initiative, a U.S. Department of State program aimed at increasing opportunities for academic mobility between the U.S. and other countries in the Western Hemisphere, the students have dedicated two weeks to learning about engineering practices in the U.S. and experiencing life as a UTSA student. 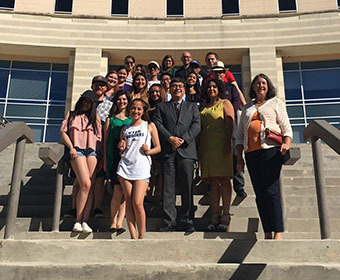 UTSA and Universidad EAN collaborated to draft a proposal for the initiative and won a $25,000 grant to create an exchange program between the two universities. As part of the project, students from EAN spent two weeks at UTSA and later this summer students from UTSA will travel to Colombia. The Obama Administration in 2011 created the 100,000 Strong Initiative for universities that demonstrate the greatest commitment and innovation toward increasing study opportunities between the U.S. and countries in the Western Hemisphere. “The main goal here is to get students motivated to broaden their perspective, learn how to work with people from different cultures and for students to see how they can work together to achieve common goals,” said Marjorie Maia, international officer for Universidad EAN. A typical day for the Colombian students consists of attending a customized English class provided by the Office of ESL Services with a focus on engineering-specific terms. Afterward, they attend engineering courses on soil contamination and sustainability with UTSA students who are part of the exchange. The students also see all that UTSA has to offer, including a campus environment they don’t have at home. In Bogotá, attending university in a city with 10 million people doesn’t provide the same atmosphere a student gets at a U.S. university, said Alberto Uribe, Universidad EAN professor. “I had one student tell me she felt like she was in a Hollywood movie,” Maia said. The team goes on excursions during their off time, doing everything from exploring the Alamo to eating hotdogs at a baseball game. “Everyone at UTSA has been extremely welcoming, from the cafeteria workers to the students and professors. Before I came here, I had no idea what it might be like. It’s been marvelous,” said student Ivan David Santiago. But the exchange is much more than a travel adventure. It’s an opportunity to develop skills and ideas that others in Colombia can learn from. “To me, this experience has helped in the sense of networking with other professionals in our fields. Being here helps you recognize some of the problems your country faces and how to tackle them in a way we might not have thought of before,” said student Nicolas Sarmiento. Vanessa Bernal, a student whose family consists of engineers, said what she’s learned goes beyond the classroom and what she’s learned at home. “Stereotypes have been broken. Barriers we thought we had, we don’t. And people in San Antonio are extremely open and friendly to us,” she said. Like UTSA international programs leadership, Uribe said he, too, hopes this exchange can be a stepping-stone to future projects with UTSA. The engineering class was chosen because it’s the newest department at EAN. Others at the university have already expanded their internationalization efforts. The partnership with UTSA’s team was an ideal match. Learn more about the UTSA Office of International Programs.